I keep thinking of great bloggy things that I want to write about, and then I go off and do something else (like mow the lawn or hang out the laundry) and my ideas fly away like birds. Scattershot. So instead I’ll catch you up on my sewing life. I signed up to take a block of the month class at my LQS (that stands for local quilt shop for all you non-quilters who wonder what the heck I’m talking about.) 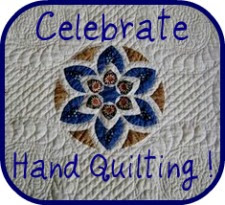 It’s a applique class that will teach me all the cool things that I can do with my sewing machine beyond simply sewing. This is my first block. I added the bird and his tail is going to extend over into the sashing, which is why it looks unfinished. I HAVE to add my own creative mark, right? Right! It’s machine applique. I’ve never done machine applique before and I am still sitting on the fence with it. It looks very…manufactured (to me, anyway.) It’s a very different look from needle-turn-by-hand. I’m linking this new project up to the NewFO Challenge over at Cat Patches. The object of the challenge is to start a NewFO (new fabric object) every month, which can then become a UFO (unfinished fabric object), which is something I have no problem accomplishing, lol! And I also started a project from a book, which makes me eligible to link up with the Let’s Book It party over at Vrooman’s Quilts. The object here is to make a project from a book that you actually already own. What a concept! I have an entire shelf (okay, two shelves) of quilt books full of things that I want to make someday. So I have started an applique project from a book that I’ve had for years, called My Whimsical Quilt Garden by Becky Goldsmith Linda Jenkins. It uses needle-turn applique. Here is my first block, which is NOT finished yet. PLUS, I made the Ring Toss quilt (blogged here) from my Project Linus book. So I am doubly eligible for the Let’s Book It party! AND, my Grandmother’s Flower Garden quilt is featured this week as part of the Tuesday Archives over at Val’s Quilting Studio! It’s really cool to see my quilt featured on someone else’s website! Go check it out! I am still working toward my goal of sewing a dress out of real fabric (as opposed to a bed sheet). Now…can I get a Whoop Whoop? This entry was posted in Books, Crafts, Creativity, fabric, furry helpers, Quilting, Quilts, Shuswap and tagged applique, grandmother's flower garden, Let's Book It, Ring Toss, sewing room update, Tuesday Archives. Bookmark the permalink. it’s a monthly sew what you want from a book linky, she has opened the October link up yet, but I am sure she will. Whoop Whoop!!! I like that BOM. Love your colors! I’ve made that whimsical flower garden and loved making every block!!! You”ll enjoy it and I’ll look forward to watching your progress! Love the sampler from your LQS class too! I have way too many quilt books but find them inspiring even if I do not make something from every book. I am currently making scrap quilts for kids’ charities. I put flannel on the back of a few to make them extra cozy. Also trying to make a couple of quilts for Christmas gifts. Thanks for sharing your sewing photos and your adorable doggie! I love the birdie! It will be so sweet that the tail goes over the edging. Yay! Whimsical is a great book to play with. So many pretty projects. I haven’t sewn clothing in many years. Oh I have that Whimsical Flower Garden book. One of these days…thanks for linking up. Cute stuff here.